A Middlesex University student is well on the road to entrepreneurial success - with her unique range of fashion accessories. Huyen Dao Thanh, 23, graduated this month with a degree in Advertising, PR and Media. And, with the expert help of Middlesex University's Enterprise Development Hub, she is already making waves in the business world with her innovative start-up venture Blowties.com. As the name suggests, Huyen specialises in making handmade bow ties - with a twist. 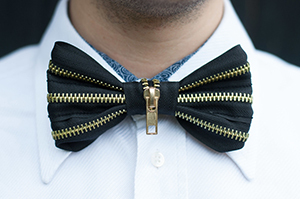 Each item is a real statement piece, with bow ties created using striking materials including zips, rainbow fabric, gold studs and animal print. Huyen was born in Moscow and grew up in Bucharest, in Romania. However, her parents are originally from Vietnam - and this is where she sources her unusual fabrics from. Many of the fabrics cannot be found in the UK, which adds exclusivity to her designs. Huyen, who lives in Finchley, explained what the Blow Ties brand is all about: "Blow Ties is a concept for those who dare to stand out and lead, for those not afraid to be different, for those courageous souls who everyone else aspire to be. "Blow Ties challenges the fashion industry with handmade products that promise quality, durability and sense of aesthetics. The Blow Ties brand stands for the generation that thinks on its own, and for the small ideas that can have a big impact." The young entrepreneur has already begun to sell her creations, at London's trendy Brick Lane market and online. Huyen loves speaking directly to customers, so she can make sure her products suit them perfectly. And the business is already expanding - she is about to start trading at the Old Spitalfields Market as well. You can see and buy Huyen's full range at www.blowties.com. Middlesex University's Enterprise Development Hub supports would-be student entrepreneurs to develop business ideas and offers students, alumni and staff support to research, develop, start and make a success of their business.